How Should An Athlete Set Goals For Their Sport? How should an athlete set goals for their sport? See what some of our forum members have to share about this topic. This is informative and worth a look. Check it out. TOPIC: How Should An Athlete Set Goals For Their Sport? We all know that different sports require different skills, but there is a similarity between all athletes - GOALS. What are the most important goals for an athlete to set? What does an athlete need to do in order to achieve these goals? How does an athlete know what kind of goals to set? Bonus Question: How often do you set goals? How many do you set at a time? Do you break them into different categories of goals? To use your credit, email Will @ will@bodybuilding.com for more info. We all know that different sports require different skills, but there is a similarity between all athletes - GOALS. In this article, I will focus on what type of goals there are, how athletes should set them, as well as what it takes to ensure these goals turn into reality. Read on. There are few limitations as to what an athlete can set goals for, whether it be to improve their speed, score more points or control off-field behavior, but when it comes to how you set them, you need to be well-equipped with the right knowledge. Before anything, you need to think in terms of short and long term. Short-term goals are those which can be completed over a shorter period of time, and are usually less difficult. These goals are vital because they provide athletes with a short-term vision of what they are aiming to achieve, and if done regularly, will help maintain a degree of direction, as well as set up a foundation for achieving your longer-term goals. Short-term goals can be set anywhere between weekly to monthly, but preferably done as regularly as possible to maintain sight. The more regularly you set goals, the more satisfaction you&apos;ll get because you&apos;re achieving things more often. Considering achievements drives us, so there is much less chances of giving up. The more you achieve, the better-conditioned you are to see your future goals as challenges, rather than obstacles. Go to all of my training sessions for the next 2 weeks. Score 10 points at this weekend&apos;s game. Increase my bench press by 5-10lbs. See Goals As Challenges, Not Obstacles. One vital ingredient toward setting effective short-term goals is to keep them realistic. There is only a short time to achieve these goals, so anything too big can be overwhelming. When you are under this sort of pressure, chances of achieving your goals are small. I used to set goals that were largely out of sight, and I largely regret it. I would never feel satisfied, being tangled in a web where I continuously set goals, but never felt like I was getting anywhere. Someone who doesn&apos;t set overly high standards on the other hand will be so much more relaxed and in a better state at achieving something big. The SMART Way To Set Goals! The SMART Goal Setting principles will help you reduce your chances of setting goals that you wouldn&apos;t be able to obtain even if you had some sort of superhuman powers. Long-term goals on the other hand are your big prize. They will provide you with a vision of what you want to achieve over the long-term. These are usually something of a more difficult nature; such a season-long goal like scoring so many points that year, making the finals or losing 25 pounds. I&apos;ve provided examples individual goals you can set for your own sport in the following section. The importance of setting a goal that is achievable applies to long-term goals just as much as shorter-term ones. It&apos;s a lot easier to lose track of your goals over a longer period than it is a shorter period, so choosing a goal you actually believe you are able to do will reduce your chances of giving up. Some prefer to further split short and longer-term goals into behavioral goals, and outcome goals: Behavioral goals are goals that work with your behavior, such as practicing shooting for 2 hours, or eat healthier food, while outcome goals are what you hope to achieve from your behavior goals, such as, score a minimum of 10 points each game, and losing 15 pounds in two months. Some athletes prefer not splitting goals into behavioral and outcome goals in fear that outcome goals are actually counter-productive. Here are some positive and negatives setting your goals up this way. When you only set behavioral goals, your main focus is on your behavior, with little focus on the outcome. Using outcome goals, you are working at turning your behavioral goals into action. Using outcome goals as well as behavioral goals encourages you to take your goal more seriously. It&apos;s easier to slacken off in effort when you&apos;re only dealing with your behavior. Outcome goals can be largely out of your control. For example, you may have a goal to score 10 points for every game this season, but things you can&apos;t control such as the weather puts you in a position where the goal becomes unlikely. Unlike behavioral goals, outcome goals can leave you frustrated at times you can exert no control over what happens. Setting outcome goals can be a disadvantage when you&apos;re setting team goals. You can set a goal for your team to place in the finals for example, and even though you played exceptionally well, it could have been your teammates who let you down. This problem won&apos;t occur with behavioral goals because here you are totally in control. Teammates May Not Always Come Through. Whether you decide to employ this style of goal-setting is up to you. Now you know a little about goals, in the following section I will discuss what it takes in order to turn them into a reality. In order to achieve your goals, it comes to down to more than simply writing them down. Aspects such as persistence, dedication, focus and a having some sort of support all become a large part of how successful you are with the goals you set. Following is a list of 10 principles that will help ensure you not only write your goals down, but turn them into a reality. Putting in "the hard yards" is clearly the most important factor. You&apos;re not going to achieve anywhere near what you want if don&apos;t apply yourself to what you&apos;re doing with 100 percent effort. You&apos;ve probably been told hundreds of times by your past coaches, and even your parents to "give it all you got," or "Don&apos;t slacken off." Although these sorts of comments become stale after a while, you can never overlook them. "You only get out what you put in," if you don&apos;t put in, don&apos;t expect to get results. Being committed is all about accepting that although your goal will be difficult, you will still put in anything you need in order to get to where you want. People who commit to things view sacrifice as necessary, rather than option. Therefore, they are able to sacrifice things they love a lot easier, which improves their chances of maintaining their goals. The feeling when you commit yourself to something, then gradually see your improvements, is amazing. It&apos;s difficult to make any sort of long-term commitment to something unless you have some self-discipline. Self-discipline is having a certain degree of control over one&apos;s own actions. It takes a lot of mental strength to say "no" at times when you just feel like saying "yes," but this sort of mentality is what separates champions from chumps. With a sense of discipline, you condition yourself to handle hard situations with what it takes to succeed. We all know real champions are those who push their physiques to the limit and accept nothing but the best from themselves. Their success can be isolated to one point. Discipline! The right attitude goes hand in hand with putting in hard work. On the other hand, negative attitudes are one of the main reasons why people aren&apos;t putting in the hard work in the first place. One with a serious attitude, who is able to accept responsibility, and do them with enthusiasm, will be in a better position to put in the hard work that is needed to achieve their goals. Dedication is all about allocating every bit of your energy and effort into your goal, and stopping at nothing. Someone who is dedicated is highly motivated. We all know how vital motivation is to success in life, and sport. Keeping a positive mentality, someone who is able handle the bad situations and enjoy the good ones, will help give you the drive and determination to dedicate yourself 100 percent. Unfortunately, it&apos;s impossible to succeed at all of your goals, but it&apos;s up to each individual to accept the fact that failure is sometimes inevitable, and that they should keep persisting at times of difficulty. It&apos;s comes as a natural instinct to feel bad at times of failure, but keep in mind that what happened was just one mistake, and you have a lifetime of successes awaiting you if you keep going. Composure in order to get through these situations is vital. At times of failure, it will make it a lot easier to step back, compose yourself, and look at your problems realistically. Make any necessary changes to your goals, then keep persisting with them. Most of the times people fail to realize exactly how insignificant their mistake really was. It&apos;s important to continuously track your progress of your goals at regular intervals. This simply involves reading over each of your goals and seeing what you are achieving, and in what areas you may be falling behind. This will allow you to create a conscious attitude of what you&apos;re doing, which will help maintain focus until you set your next goals. It&apos;s easy to lose track of the goals we&apos;ve set. Things like mental imagery, where you visually see yourself achieving your goals, is one great way of avoiding losing that direction. An athlete who is focused has only thing on their mind; the final destination of their goal, and won&apos;t let anything sidetrack them in getting there. When an athlete holds this sort of focus, there is no saying as to what he will achieve. The amazing thing about the future is that if you wait, it will always come to you. By reading this you should gain some insight to making goals and actually keeping them. With today&apos;s hectic lifestyles, it seems as if there is always something time-consuming and unexpected thrown at us. As a result, it&apos;s important we get our priorities right. If you&apos;re someone who prioritizes your goals, you accept that you can&apos;t do everything, and are willing to sacrifice certain aspects of your life. These people are likely to succeed because regardless of whatever else pops up, your goal will still be your No. 1 priority. Although the amount of support one has can be largely uncontrollable, you can make an effort to try to surround yourself with positive people. When you are surrounded by people who believe in what you are doing, you will feed off that support positively, which can impact your performance. A lot of us are lucky to have certain mentor who will act a role-model, whether it be a parent or coach or someone else, providing us with the encouragement we need to get through hard times. You should now know about short-term and long-term goals, as well as behavioral and outcome goals, but how do I put all of this into action? First, you have to know that what goals you should set are highly individual. Not everyone is the same, and one person&apos;s strength may be another person&apos;s weakness, therefore what everyone will focus on will be different. Focus on areas you need to focus on. Analyze which areas you need improvement in, and prioritize these. You can set both on-field goals, such as increasing speed, agility or strength, and you can set off-field goals such as changing sleep patters or eating healthier. Goals can also be personal goals, or team goals. Either way, both will bring tremendous satisfaction. So where should I get started? Following is a sample of how you can use goal-setting for your own sport. Each area then defines one particular weakness you have, and focuses on improving it. Main Area For Improvement: Tackling. Behavioral Goal: spend 30 minutes after every training session practicing tackling with 2 teammates. Outcome Goal: Record one more tackle on average for each game this month. Personal Outcome Goal: Improve my tackling average by 50 percent in comparison to last year. Team Outcome Goal: Make it to the finals. Main Area For Improvement: Swinging power. Behavioral goal: Don&apos;t miss a weight training session for the next few weeks, or perform missed sessions the following day. Outcome goal: Add 5-10 lbs onto bench press within the next two weeks, and hit the ball with more force during my next 3 games. Personal outcome goal: Score a higher amount of home runs than your amount last year, even by one. Team outcome goal: defeat a team you haven&apos;t defeated for some time, but have come close to beating in the past. Build Incredible Bat Speed For Baseball & Softball! No one knows more about improving bat speed than Bob Alejo (former strength and conditioning coach of the Oakland A&apos;s and now the Personal Conditioning Coach of NY Yankees&apos; Jason Giambi). Learn how Bob gets his athletes to have a blazing fast swing! Main Area For Improvement: Rebounding. Behavioral Goal: Practice rebounding with 2 teammates for 30 minutes after each training session. Outcome Goal: Get 1 more rebound on average per game for the next month. Personal Outcome Goal: Score 25 percent more rebounds for the season in comparison to last year. Team Outcome Goal: Make the final. Main Area Of Improvement: Scoring. Behavioral Goal: Spend an additional 20 minutes practicing a particular skill with a team mate after training. Outcome Goal: Score at least one touchdown within the next 2 weeks. Personal Outcome Goal: Score 10 touchdowns by the end of the season. Team Outcome Goal: Display more of a leading instinct. The Football Player Of Today: A Grid Iron Machine! 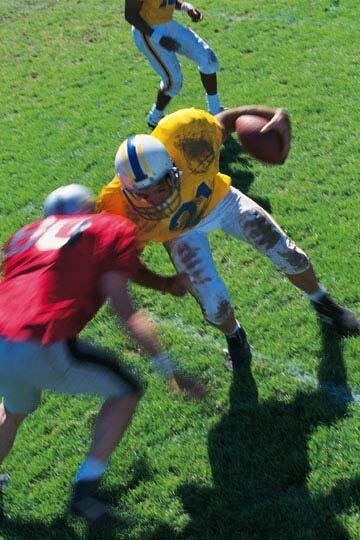 Football is probably the most physically demanding sport on the playing field today. It requires a combination of speed, strength, power, agility and mental toughness. Behavioral goal: Increase frequency of weight training from 3 days to 4 days per week. Outcome goal: Add 20 pounds onto your deadlift in 4 weeks, and hold your ground with more strength during your upcoming matches. Personal Outcome Goal: Win 75 percent of your wrestling matches. Behavioral Goal: Set aside one hour each weekend to practice dribbling and foot skills. Outcome Goal: Record at least one less turnover per game for the next 4 weeks. Personal Outcome Goal: Be comfortably able to dribble the ball past an opponent at training by season end. Team Outcome Goal: Congratulate teammates after good on-field decisions at least 3 times during each game this season. "Ensure I am eating healthy most of the time,"
"Stop eating so much chocolate and potato chips." "Make 4 tackles in my match on the weekend,"
"Don&apos;t be a weak player." "Ensure I am going to 9 out of every 10 training sessions,"
"Go to training more often." How often do you set goals? How many do you set at a time? Do you break them into different categories of goals? I set small goals everyday, both sports-specific and non-sporting goals. I&apos;ll set 4 of what I call progressive goals daily, which lead toward my weekly goal. I usually break them down this way: one sport/fitness related goal, one school related goal, one social goal, as well a goal specifically targeting something I&apos;ve been ignoring. This largely helps with procrastination. My daily goals are always small and achievable. I do them for the simple reason of not losing sight of my bigger goals. I set these goals every 2nd week. These are still short-term goals, only difficult to a point where I still believe I can achieve them. I then set long-term goals which I aim to achieve in anywhere between 4-8 months. I like to set longer term goals with a time range because it&apos;s harder to predict how long it will take to achieve longer goals, and it&apos;s better doing this than under predicting how long it will take. I set one long-term goal for each of the four areas I listed above. Right now, I have a sport/fitness goal of increasing my scoring accuracy in football from 55 percent to 75 percent by season-end. I know I can achieve this because it is not overwhelmingly impossible, and I&apos;ve set easier goals and seen a lot of success in the past, so I&apos;m confident it will become a reality. I wouldn&apos;t be able to kick the ball as far as I do now, or play as aggressively as I do if it wasn&apos;t for all the goals I&apos;d set in the past that have moved to where I am today. Although at times goals may seem insignificant, they are small stepping stones that will help create the ladder toward your final destination; whatever your sport be. Not only will goals give you direction, but they will fill you with the self-confidence and burning desire to make you feel like you can achieve almost anything. May that power be with you. Good luck with all you goals. All sorts of goals, in general, have been affiliated with athletics for years, but a new era has come about. In every aspect of our lives there are goals or quotas to meet. In school there are GPA requirements, at work there are performance numbers, in social life there are certain levels to achieve, never has there been more pressure on one to perform and meet these goals. The same has been transmuted heavily into the world of athletics, fittingly fulfilling the prophecy of the definition, if you will. Nowadays, there is much weight placed on how athletes prepare in the off-season, and how they arrive before the season starts. It has given birth to a cottage industry and new terms, something the founders of our respective sports would not have dreamed of. There is now media coverage of how athletes "come in," "arrive," "show up," and "appear" at preseason training camps and evaluations. Chances are that the media will cover an athlete that comes in "looking heavy" or on the contrary, maybe a "new slimmer version" may be spotted. Before, only the top Olympic athletes could receive top-notch training, usually provided by their countries. However, training centers have appeared all over the globe, training athletes from 5-year-old golf prodigies, to university level athletes looking for the edge over their teams regular workouts. In this ultra competitive environment, it is vital to do everything to perform at optimal levels, and setting cogent goals is at the heart of top on-field performance. I want to start of by explaining what goals are USELESS for an athlete to set. First off, I don&apos;t believe field goals are necessary at all, and they may even become a negative influence on athletes participating in team sports. Athletes come in all shapes and sizes, but all of us love to compete. When it comes to on-field competition, if one needs goals (which end up becoming trivial quotas) to succeed, then the cause is lost already. The truth is that the atmosphere of athletic competition is motivating enough as it is, and setting goals to meet in that venue is assuming that without them, the athlete will not perform up to his or her standards. They can only become a distraction. John is a long jumper. At the championship meet he sets out to jump a certain distance, one which would be a personal best. His initial jumps put him in a clear position to win, however, as his mind becomes bogged down with the goal he set for himself, he is not simply able to go all out as he did before, he loses his concentration and jumps poorly for the rest of the competition. This is one of the biggest problems with sports today, the intense fascination with individual statistics in team sports. It hurts the team greatly to have a player who is constantly setting some sort of quota to meet, whether it is points, goals, yards, etc. It can lead to disputes and even more likely poor decisions. Dave is a point guard for his basketball team. To be recruited heavily, he needs to average 20 points per game. It is the last game of the season and he knows he only needs exactly 12 points in this last game to achieve this mark. In the last second of the contest, while his team is down by one, he only has 9 points, well aware of this situation, he takes a low percentage 3-point shot instead of lobbing it up for the team&apos;s big man who is open and at a size advantage. He misses the shot, his team loses, and he gets depressed because he ends up averaging 19.9 points. It all stems from the fact that goals are most necessary to sustain motivation and the right mindset when it is easy to get off track, this situation rarely presents itself on the field of play, rendering goals useless and dangerous to set in that situation. As far as off-season preparation goes, goal setting is imperative to the success of an athlete. There is a problem though, as an athlete the main goal is to become excellent at the target sport, sport specific skills are most important, however the physical aspect gets confusing. A powerlifter simply wants to increase each of his lifts as much as possible while staying in the desired weight class, a bodybuilder wants to simply gain muscle without fat, and lose fat without losing muscle. Athletes have numerous things they can tweak to improve their performance. This makes goal setting as an athlete hard! Developing a sound set of goals as an athlete is both an art and a science, comparable to predicting the weather. There are a lot of knowns and unknowns, a lot of hunches, a lot of patterns and a lot of prior experiences. Achieving goals is a combination of motivation, work and a bit of luck. Most often a good plan is needed. Once the overall scope or blueprint is set, the tasks need to be subdivided. All the options for this are too vast to explain. They can be split up by the aforementioned goals involving the contradictory effects of calorie manipulation, or by simply dividing the total necessary progress into time periods and concentrating on achieving those goals in those desired lengths of time. If the goals are either not achieved, or far surpassed, they should be calibrated to better fit the athlete. Other changes may need to be made based on certain other circumstances. Mike was a running back going into his senior year. After a successful junior year, scouts told him he needed to improve a little bit in all aspects of his performance, nothing too drastic. At 5-foot-11, 185 pounds he was at 15 percent body fat, benching 225, squatting 385, and running a 4.7 40-yard dash. He decided to set a goal to be 200 pounds at 10% body fat, running a 4.55 40-yard dash with a 300-pound bench press and a 475-pound squat. Living in the northwest USA, he knew that he could use the winter to bulk up. So during the time period of December through April, he decided to gain 25 pounds to get up to 210 pounds, lift heavy and gain most of the strength he needed for his lifts, only leaving about 15 pounds to go on each lift, all while running sparsely but effectively to retain his speed. As soon as the weather got warmer, he set out to lose a body fat and gain speed while only having a bit to go to reach his strength goals. He ended up coming in at 198 pounds 10 percent bodyfat, running a 4.57 40-yard dash, squatting 500 pounds and benching 295 pounds. His senior year was a successful campaign. First we should start with the easiest goals to set. These include aspects of performance that simply need to be performed to be sufficient, for example, doing core work, cleaning up diet, practicing a skill. It is hard to put a concrete condition on all of these, but luckily it is often as simple as performing this on a regular basis. Doing ab work twice per week for the whole off-season is going to be more than plenty. The same goes for ridding one&apos;s diet of soda, or making a resolve to perform some aspect of one&apos;s sport once a week. This is easy, conflicts with essentially nothing and will benefit nearly everyone, just remember to do it. First off: NEED An athlete should ask themselves: What do I NEED to be successful in my sport? Jim is a wrestler in a lightweight class. He really would like to get a lot bigger and put up some impressive lifts. A 300-pound bench press is on his mind as he can only do 185 pounds at the moment, and he&apos;d like to get his biceps to 16.5" up from the 13" they are at now. However, realizing that in order to achieve his dreams, substantial weight gain would be necessary. Further, he realizes that this would knock him out of his weight class, in which he has a good shot at competing for the state championship in next season. So he puts those longings on the backburner and sets goals more attainable for him while still staying within his weight limit. He ends up bench pressing a formidable 250 pounds and winning the state title, earning a scholarship in the process. Athletes need to know their situation with the general need for their development (quest for more athleticism or power for example), whether this is determined by their position, weight class, event, etc, is up to them. Once that is clearly known, the athlete can move on with more strict goals. No drastic changes but nice regular gains all around. Next an athlete needs to set quantitative goals. These are usually the most powerful and pronounced goals on an athletes mind. They need to be set in a smart fashion, with reasonable expectations. The basic goals should consist of core lifts: bench press, squat, deadlift, Olympic lifts, etc. In general, these should be evaluated based on certain principles to set achievable, yet challenging, goals. As general rule, beginners will make more progress, as will those dedicated to making themselves stronger above all else. Those already advanced and lifting big weights, and those that are able to put strength on the backburner should set modest goals to avoid pressure to achieve goals that are too unreasonable and unnecessary. If you are a shot putter, go ahead, go crazy with it, if you wan to run a marathon, I think your efforts can be better spent! In regard to goals outside the weight room, it is important to realize that basic tests are sufficient. For example, improving in the infamous 40-yard dash is a guarantee that overall explosiveness and speed will improve as well. In many cases this training is a means and not an end, which means that certain activities should simply gauge progress and don&apos;t have to be concretely related to the sport. Certain sports, especially those related to quantitative performance such as track or cross-country have already set tests that relate 100 percent to the athlete. Body composition should be the last thing on one&apos;s mind, but it should be considered, after all who wants to play against someone who looks like Ronnie Coleman?! Positive body composition change can improve performance and looks, after all there is more to life than athletic performance. Mark is an outfielder going into his freshman year of high school. He has hopes of making the JV squad and has 7 months to train before the season starts. He plans to gain 15 pounds, increase his bench press by 50 pounds, his squat by 90 and deadlift by 100. He is shooting to shave .2 seconds off of his 100-meter dash time while adding 2 inches to his vertical jump. A grave mistake that many make in setting goals is setting them generally too high or too low, and a failure to adapt to changes. Like I mentioned before, goals should be set to be as accurate as possible, if they are not, problems can arise. Low Goals: The clear problem with goals that are too easy to achieve is that the positive effect of motivation from goals is lost. If one achieves their 4-month goal after a month, they may be satisfied. What happens then? A potential waste of 3 months! An athlete should aim to increase squat the 1 rep max by 60-100 pounds per off-season. Overambitious Goals: Saying you are going to run a sub 10-second 100-meter dash may be impressive, but the probability of that happening is close to 0. Absurd goals will end up causing a loss of motivation as they end up being impossible, spinning the athlete into a depressed state. Goals that aren&apos;t sensitive to situations can also be too high by nature. Chris is a soccer player that decided he will increase his squat by 100 pounds in the off-season. With one month to go, he still was 30 pounds off. While all his other teammates participated in preseason conditioning, he opted to satisfy his thirst for his goal and subject himself to brutal leg workouts, leaving no room for any running. He still ended up missing his lift by 15 pounds and was actually cut from the soccer team for being out of shape. Lots of things can come up. Many of them will change situations, and goals should adapt too. This can be anything from a change in position, weight class, track event or even sport altogether! Unfortunate injuries can also hurt the progress necessary to achieve certain goals. If the athlete does not adapt, their now useless goals can cloud their judgment and ruin their performance. Being a defensive lineman in the sport of American football, I am forced to set goals constantly. Some may say I am a bit obsessive compulsive with my goal setting, but I feel that I need strict goals to keep me on track. Weight, bodyfat percentage, bench press 1 rep max, bench press reps with 225 pounds, 185 pounds, and 150 pounds, squat 1 rep max, power clean 1 rep max, substantial improvements in lifts such as Romanian deadlifts, curls, pushups, glute hamstring raises, military press, incline press, etc. All along with improvements in the 40-yard dash, pro agility, vertical jump, etc. In general I strive to become "bigger, stronger and faster" which will improve my on-field performance, while also practicing true football skills, which is a bit challenging because of the nature of the sport. As far as categories go, I do like to divide the goals up into categories. Obviously there are goals, strength is one good example, that I always strive to improve. But it is just reality that certain situations will lead to better progress in certain areas. I have come to accept that. For example, I want to bench 400 and run a 4.85 40-yard dash, but I am not going to beat myself over the head if I run a 4.9 and bench 395. The goals will serve their purpose either way. Good luck to all with goal setting! When done properly it can take your performance to a whole new level, plus reaching goal is the BEST FEELING ON EARTH! "Success comes to those who are too busy to be looking for it." We all know that different sports require different skills, but there is a similarity between all athletes - GOALS. In sports, there are two different types of athletes - those who set goals and carry them out and those who set goals and do nothing about them. Those who set goals and carry them out are the athletes who are the most successful in their respective sports while those who don&apos;t carry out their goals are those who are often underachievers. Setting goals will tell you what you want to achieve and will help you narrow down your efforts to specific areas. You will also be able to get rid of distractions that would otherwise hamper your progress. (www.mindtools.com). First of all, an athlete should separate their goals into long term and short term goals. Short term goals include: increase my bench press by 30 pounds in the next 6 weeks, jump 3 inches higher in the next 3 months, and other measurable goals achieved in a relatively short period of time. Long-term goals might span an entire year and would encompass things like: dunk a basketball consistently by the end of the year, bench press 250 pounds by the end of the year, and make the varsity basketball team. The most important goals for an athlete to set are sport-specific goals. For example, a basketball player would not have to set a goal of running a 40-yard dash in under 4.6 seconds while a football player would not need to set a goal to dunk. Instead, the football player could set a goal to gain 25 pounds of muscle in a year and the basketball player could set a goal to shoot 90 percent from the free-throw line by the end of the year. In other words, do not spend time trying to reach a goal that you do not even need to achieve for success in your particular sport. Sometimes setting such goals can actually be detrimental to success in your given sport so make sure that all your goals are sport specific or strength oriented toward your sport. Visualization is the process of "daydreaming" about what you want to achieve. It can be performed for approximately 15-20 minutes each day, preferably about different qualities each time around. For example, thinking of yourself performing certain moves and succeeding is often quite effective. However, what you visualize needs to be plausible, for example, visualizing a 75-yard touchdown pass will not do you any good if you can&apos;t throw a football 50 yards. However, visualizing a dunk when you are close to doing it in reality helps a lot and may actually help you to dunk much sooner that if you just waited and trained until you were physically able to do it. Using Visualization To Enhance Your Sporting Prowess! Learn about visualization and how it can improve your performance in any sport that you participate in. Some examples given here are in basketball. Visualizing something is very similar, in terms of neurological impulses, to actually doing it. Often, your brain will be "used to" performing the action because you have visualized it so much. Here is a fantastic article about visualization. Hard work and determination are two qualities that all successful athletes have. These are attributes that can&apos;t be taught, but are ingrained qualities that help athletes overcome genetic shortcomings. However, hard work can be learned to an extent. It usually takes an excellent coach or mentor to teach an athlete work habits. Sometimes, learning how to work hard can even start in the classroom and this eventually transfers to sports. If you have a difficult time being motivated to work hard, just look around at the athletes around you and the pros playing your sport. You will see that they all worked extremely hard to get to their current level and work even harder to maintain that level and get better over time. Kobe Bryant once said that no matter how good you are at basketball, you must work extremely hard in order to be successful. How Long Do You Practice Your Favorite Sport Per Day? Setting goals will not be effective at all if you are not able to actually workout or practice your sport. You can set all the goals in the world but if you don&apos;t do anything to achieve them, the entire process in pointless. You need to be consistent in your training and sport-specific practice in order to achieve your goals. Making a workout log can go a long way into determining how much consistency you will have in your training. Being consistent will translate to success in your given sport because it is the one thing that separates the great players from the average ones. Other factors such as nutrition, rest, and time spent on training will all be important in determining whether an athlete will be successful in reaching their goals. If you want to gain muscle, you must have a caloric surplus, that is, you must consume more calories than you expend. As a general rule of thumb, eating 500 more calories than you expend will help you gain approximately 1 pound of bodyweight per week. If those calories are mostly clean, i.e. not junk food, and you lift weights regularly and lead an active lifestyle, then almost all of that weight gain will be muscle. One of the keys to building muscle is eating at least 1 gram of protein per pound of bodyweight. Another key to building muscle is having a sufficient amount of carbohydrates for energy and for growth. Complex carbs such as rice, pasta, whole wheat bread, muesli, granola and oatmeal should be ingested for maximum effect. The often forgotten variable to a balanced diet is healthy fat. Many people eat greasy foods such as hamburgers. However, they should concentrate on eating enough flax seed oil, fish oils and nuts such as almonds. Additionally, fish oil supplements can be taken so you make sure you eat enough healthy fat. To View Top Selling Fish Oil Products Click Here. If you want to build muscle, a good investment would be a multivitamin to ensure that get all the nutrients and vitamins you need. Many people would be surprised how well a multivitamin can assist muscle growth. Basically, if you hit a plateau, eat about 250-500 calories of healthy foods more per day and you will be amazed and what it can do for recovery and growth. Make sure you rest enough so you can recover for your next workout as well. Too many athletes can be seen lifting weights five times per week, doing some sort of high volume plyometrics program and in addition playing their sport every day of the week. Realistically, no body can handle such strain. Athletes would be better off working out 3-4 times per week with a well-planned plyometrics program if necessary, and playing their sport 2-3 times per week for about an hour working on fundamentals. This way, the body will be able to recover and therefore gain muscle much faster and goals will be reached all the time. Constant motivation certainly doesn&apos;t hurt as well. An athlete would know what kind of goals to set based on their own analysis of what they are physically able to do. For example, someone who bench presses 100 pounds shouldn&apos;t make a goal to bench press 200 pounds in 2 months because that is impossible - no matter what kind of genes they have. Goals should be set that are somewhat difficult to reach but are not impossible, i.e. goals that need hard work and determination to reach but are not completely out of the realm of possibility. For example, an athlete could break down their goals into different categories such as 5-year goals, 1-year goals, 6-month goals and 1-month goals. Then the athlete would be able to assess themselves monthly, biannually, annually and once every five years. These goals could be changed at any time in order to adapt to unforeseen changes or amazing progress. A daily workout log would go a long way to help you to know what kind of goals to set. I usually set goals at the beginning of a training mesocycle and then reevaluate the goals every 2-3 months to ensure that I am making constant progress. I usually set a few sport specific goals for basketball such as vertical jump and a few goals for progress in the three major lifts: Bench Press, Squat, and Deadlift. That way, I can monitor my progress in a basketball-specific manner and in one that deals only with strength. I break the goals up into two categories - sport specific and strength. I have an entire chart that deals with goals in: Bench Press, Full Squat, Deadlift, and Power Clean maxes and Vertical Jump, 40-Yard Dash, and Bodyweight. This enables me to maintain a high level of performance throughout a training year and improve performance consistently because I know how much I need to gain per week in order to reach the long-term goals. I have approximately five checkpoints throughout the year to ensure that I am making constant progress and that my gains are not diminishing. Or "Why Wasn&apos;t Mine Picked?" Lucid and informative response to outline question. This submission was light on content. Some marginal grammar and style missteps. Comments: While a generally capable submission, not enough content for a webzine. First paragraph may have been better as two. Two run-on sentences in first paragraph are uncharacteristic for this talented writer. Over use of first person pronoun "I" in last paragraph nailed the lid shut on this one. Acceptable wordmanship and coherent response. Entirely too brief to be an article. Comments: This column is a feature from Atheletes.com to allow forum members to be published on a major Webzine. In return, the website gets fresh original content. Concise and direct statements are good. There were not enough of them here to make an article. Too brief, structure of sentences and paragraphs needs work. Comments: This writer has a nice flowing style. More content and stronger structure signal promise. Sentences are generally tight, but some tend to run on. Each question is difficult to answer in a single paragraph. Writing, like boxing, is hard to do well in the beginning. Applying the authors&apos; evident work ethic to writing will yield results. Good readable sentence structure. Followed outline. Not even close on content for an article. Comments: This writer&apos;s concise tight wordsmanship could possibly improve with more conversational flow in places. More content is needed.